It’s a nostalgic feeling to write this final closing post for the Love TV blog. Over six years of interviewing cast and crew from BBC television shows, there have been, as you’d expect, highlights galore. 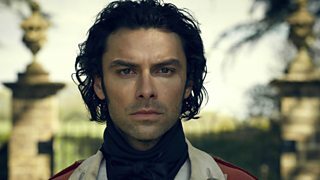 We asked Aidan Turner, out of character as Ross Poldark, whether he was really truly Team Elizabeth or Team Demelza. Line of Duty creator Jed Mercurio answered your questions live straight after the thrilling series two finale. And we shared seven exclusive deleted scenes from Happy Valley after everyone thought series two was all over. We’ve covered giant variety too, from real-life people who had an unusual experience on set (Mistresses was filmed inside my house) to A-listers like Gillian Anderson on her lead roles as Miss Havisham in Great Expectations (“a woman who is deeply, almost psychotically manipulative”) and DCI Stella Gibson in The Fall (“an enigma”). Our documentary posts have spanned stories from the assistant producer on Shark – who was afraid of sharks, to a bereaved officer from the first series of Our War to highly practical advice from Professor Susan Jebb on What’s The Right Diet For You? And some posts were just plain fun to put together – like Six Wolf Hall insults for everyday life, Mared Rhys’ perma-parka in Hinterland and Romesh Ranganathan being delightfully embarrassed by his mum Shanthi. To continue getting news and peeks behind the scenes from BBC TV you can find BBC iPlayer, BBC One and BBC Two on Facebook and Twitter. And our fellow BBC blogs – About The BBC, Writersoom and BBC Academy all feature posts about television – such as Meet the reporters from Unsolved: The Boy Who Disappeared, which you’ll enjoy if you’ve been watching it on BBC iPlayer. The BBC Love TV blog will remain online as it is so you can read it and watch clips but will be closed to any future comments. Thank you for reading and sharing and posting your comments on the blog – we have loved producing it. Fiona Wickham edited the BBC TV blog from 2010-2016.